Two of DC Comics’ most iconic superhero teams are about to square off in their own animated film coming out later this year, as Warner Bros. and DC Entertainment (via IGN) have released the very first trailer to their next entry in the growing DC Universe Animated Original Movies series with “Justice League vs Teen Titans“. Not mincing words, it’s pretty much what you expect – Superman, Batman, Wonder Woman and the rest of the league are going to be taking on their young counterparts and sidekicks, comprised of Robin, Beast Boy, Blue Beetle, Starfire, Raven, and Cyborg! Set in the same timeline as the two New 52 Justice League movies and the “Son of Batman” animated films, “Justice League vs Teen Titans” sees Damian Wayne/ Robin placed with the Titans by Batman after he messes us a Justice league mission. 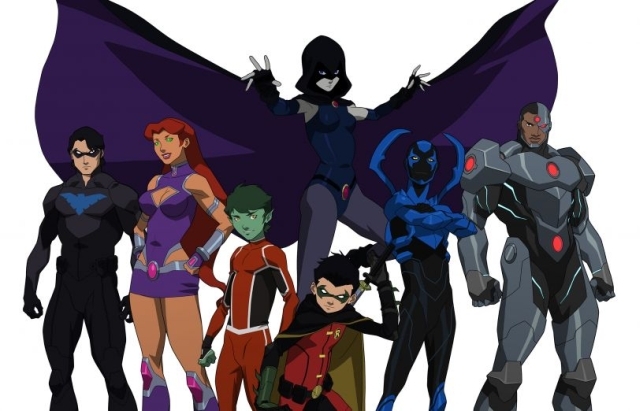 However when the demon Trigon and his minions take control of the minds and bodies of the League, it’s up to the Teen Titans to work together and save their mentors and their world from the evil threat. Justice League vs Teen Titans will be released on Blu-Ray, DVD, and Digital Video sometime Spring 2016! Previous articleLife Lessons: When in doubt, Sell out! Tales from the Borderlands continues with the crazy!